In 2007, Zhang Shuqin (張淑琴) and her family had a new cistern installed in front of their home in Ruoli, Jingyuan County, Gansu Province. The cistern was part of a Tzu Chi project to help the population in Gansu meet their demand for water. Tzu Chi had plans to build over 8,000 cisterns near residences over the next four years in Jingyuan County alone. With the new cistern, Shuqin and her family were supposed to be able to save the miles that they would otherwise have had to walk each day to fetch water. A 30 cubic-meter water tank, even only half full, could last the family over a year. The Zhang family was overjoyed to have the cistern so handy. Once Tzu Chi volunteers realized the inadequacy of the cisterns in Ruoli, they quickly developed a solution. The foundation decided in March 2008 to build a new village and relocate 210 needy households, a total of 1,050 people (about seven percent of the residents), out of Ruoli. The new village is located in Liuchuan, about two hours by car to the northwest. August is a busy time of year in Liuchuan. More farm produce changes hands than in any other month. In a bustling wholesale market, sacks of onions are stacked up high as farmers and their hired hands continue to fill sack after sack with the pungent vegetable. They are expecting buyers from neighboring provinces like Qinghai and Xinjiang, and even from as far away as Guangxi. They are also expecting better prices for their onions this season: at least 74 fen a kilogram (five US cents a pound). An average harvest yields a farmer 8,000 kilograms of onions per mu (a sixth of an acre), which translates into about six thousand renminbi (US$880). That amount is quite a respectable income for this area. Potatoes and tomatoes are also major crops that farmers in Liuchuan sell to other locales. Grinning from ear to ear, farmer Zhang Mingqin (張明秦) had just sold a truckload of onions. He commented, “None of these crops are native to the area; they’re all transplants.” Then he tilted his head and smiled as he continued: “In that case, aren’t I just like my crops? I’m a transplant too.” Originally from Caoxian, Zhang moved to Liuchuan 15 years ago. In fact, transplants are common in Liuchuan. Nine out of ten of its 31,000 residents are immigrants—mostly the result of a government policy initiated 20 years ago that encouraged people to move out of perpetually dry areas. The households that took up the offer back then were each granted a one-acre plot. The government program sounded very good to Ma Shenghui (馬生輝) of Ruoli. When he broached the idea to his mother, however, he got a stern admonishment: “You can hardly feed your family of five here with six acres; you want to trade that for a single acre down there? You’re sure to starve!” She talked as if her son was off his rocker. Ma knew that he wasn’t crazy, and he knew that one irrigated acre would yield more than his seven parched acres ever could. Soon thereafter, he took up the government’s offer and moved with his wife and kids to Liuchuan. They were penniless on the day they moved—the only things of value he and his wife owned were two sacks of wheat in each hand. They improvised a shed to live in with some plastic sheets. It had no windows and no door. Ma’s mother stayed at Ruoli with her two other sons, who three years later also moved to Liuchuan. The matriarch moved with them this time. Today, Ma and his wife live in a reinforced concrete house, have put their three daughters through college, and have picked up some more acreage along the way. Their farming income is further boosted by their daughters’ salaries; the whole family takes in more than 100,000 renminbi a year. If they had not moved away from Ruoli, their household income would have been, according to government figures, a mere 1,300 renminbi. Like most towns around, Liuchuan was once very dry, so dry that many residents lived on food rations from the government. Life was very hard back then. Because of the harsh living conditions, Liuchuan was sparsely populated: Fewer than 4,000 people inhabited the geographically vast town of 422 square kilometers (163 square miles). But all that changed when the Chinese government and the United Nations provided funds for an irrigation system to be built for the town. In 1975, an aqueduct to channel water from the Yellow River 20 miles away was constructed. Liuchuan was chosen over other towns because of its flat terrain. After the aqueduct was built, the government started offering land and other incentives to entice people to relocate to the town. Immigrants flocked in. The abundant water from the great river has since transformed Liuchuan into a prosperous oasis. Newcomers can choose to plant wheat and potatoes, the same as they used to plant back home in the arid highlands. The difference is that the abundance of water results in much higher yields. If the newcomers want to try something new, they can plant tomatoes or peaches. Some have ventured into livestock husbandry. Residents can even find work in the nearby cities of Baiyin and Jingyuan, two of the largest cities around. The immigration policy got off to a really good start, and so the Jingyuan county government kept the policy in place. Since then, over 20,000 people have moved into Liuchuan. The success of the government incentive program eventually forced its modification. As more people moved in, there was less land left available for newcomers. The government had no choice but to ease off on the incentives. The earliest immigrant households received an acre of land with ready access to irrigation water as well as timber for building houses. Those arriving later could claim the same size and type of land, but not the timber. The most recent immigrants have to pay out of their own pockets to purchase land, and even those plots are not so desirable. The result of this is that now many people who want to move to Liuchuan cannot afford to do so. And if they cannot move to Liuchuan, then they have to stay where they are, leading miserable lives in their dry, harsh homes in the highlands. Even cisterns cannot help them there. But in March 2008, Tzu Chi came to the rescue with plans to build the new Tzu Chi Laiyao Village in Liuchuan. Volunteers identified 210 families from Ruoli that they would help relocate to the new village. According to the current government policy, new immigrants to Liuchuan could no longer receive free land. Without land to farm, those 210 poor families would face almost insurmountable odds of succeeding in their transition. 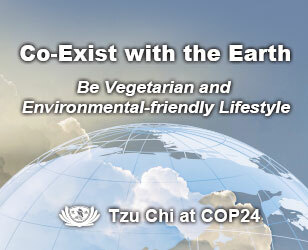 Therefore, Tzu Chi petitioned the government for a special grant of free farmland for the village residents. The authorities graciously agreed and allotted about 230 acres in two tracts, which were further divided into one-acre lots, one for each village household. Tzu Chi helped lay all the necessary pipes to channel water to individual lots. In all, each household in the new village received a house on a lot of about one tenth acre, farmland of about an acre, and a pipeline to supply the farm and the homestead with water. Each house came with a pen for livestock, a methane pit for collecting human and animal waste, and a yard. All of this was without charge. Such a large project involved and required the cooperation of many government agencies, dealing with water resources, utilities, agriculture, transportation, and education. 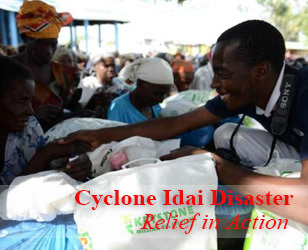 To facilitate the work, the government established a new agency called the Tzu Chi Projects Office to coordinate. In addition to the construction of the village, the office handles all Tzu Chi projects in Gansu, from the new construction of cisterns or schools to simple maintenance projects. Wang Yi (王益) has headed the office since its inception and was the point man in overseeing the construction of the Tzu Chi village. A stickler for quality, he discussed and considered all aspects of the village project, including potential village sites, resident safety, and training for new agricultural techniques that would be needed by residents. He is very mindful of how he discharges the responsibilities of his office. Wang said that his team passed on the first potential village site because a high-voltage power line passed through it. The second potential site was skipped because it was too low-lying and had an inherently higher risk of flooding. The site that was eventually selected had none of those problems and, more importantly, was right beside national route 109, making commuting much more convenient for work or school in nearby cities, including Jing-yuan (10 miles), Baiyin (20 miles), and Lanzhou (the capital of Gansu, 45 miles). Route 109 would also bring travelers, and therefore business, to town. Wang was very confident in and proud of the houses in the new village, which were built with quality materials and workmanship. He pointed out that his team had sent the village design diagrams back to the drawing board for improvement more times than they could remember. The houses were again redesigned following the great earthquake in Sichuan on May 12, 2008. Wang commented, “We thickened each wall by 12 centimeters [5 inches], and we added cross braces and columns for extra resistance to earthquakes.” Even the bricks for the homes were unloaded off the trucks by hand, to avoid chipped or broken corners. To acclimate villagers to their new homes and new agricultural practices, the Tzu Chi Projects Office conducted workshops in Ruoli before the move. The new fields required farming skills starkly different from the traditional farming methods needed for the large, dry farms in the mountains. The immigrants were trained how to farm in fields that would be waterlogged or even water-filled, how to fertilize and weed, and how to farm a much smaller plot. Wang Chengqiao (王成僑) was one of the earliest to move to the new village in 2008, when only a few units were completed. The advance training he received before he moved enabled him to do very well with his new field of kidney beans. “The land down here is indeed different from that in the highlands. My harvest here is several times greater than what I was able to eke out up there,” Wang said, referring to his field in the mountains of Ruoli. At a small eatery just a stone’s throw from the Tzu Chi village, Zhang Qiaomei (張巧梅) wiped her hands on a towel and took a break following the busy lunch-hour rush. “Sure, this is tiring, but I’m glad I can keep busy,” she said of her work tending her little eatery. Qiaomei had also moved to Liuchuan from Ruoli, where she alone had tended 7 acres of fields while her husband had worked and lived out of town. Back then, he could only go home and see his family once every four months because Ruoli was simply too far out of the way. As much as she would have liked to keep him at home, they could not afford to do so. Her family had needed his income just to survive. In another village household, Zhang Shuqin, a rising 12th grader, loves the plentiful natural light in her new home. Her old mud home in Ruoli was always dark inside, even on the sunniest days. To get some light, Shuqin usually took a desk out to the courtyard and did her homework in the sweltering heat. When it was too cold to work outside, she pulled her desk indoors next to one of the two small windows. The poor lighting in her old house hindered her studies. But those problems are memories now. 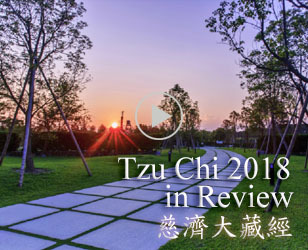 Compared with what they had up in Ruoli, these contented transplants seem to be prospering in their own way in their new homeland, just as the government and Tzu Chi intended. The town of Liuchuan is also poised for further development: It has recently been incorporated into the Lanzhou-Baiyin economic zone and has been designated an industrial zone. The town will need a larger labor force to support the expected boom, and the infusion of Tzu Chi village residents seems to have come at just the right time. It is good for the town, and it is good for the residents, new and old.
" Rather than worry about the condition of our society, why not replace it with confidence and with dedication to contribute with loving-kindness? "